At first glance the idea that someone could make an extra $12,000 per month sounds almost too good to be true. But more and more people are finding out just how lucrative this opportunity can be. In this article we’re going to explain how you can join our community of Air Nannies, spend more time with cute animals and make some extra money. If you enjoy flying and can perhaps even get cheap (or free) trips, an Air Nanny might be just the opportunity for you to make tremendous supplemental income. Everyday, thousands of people welcome into their home a new member of their family – a puppy. But often breeders are separated from buyers by hundreds, sometimes thousands of miles. This is especially true for the rarer breeds of dog. More and more people are hiring Air Nannies who will safely meet the breeder at a major airport, and then transport the pet to an airport close to the buyer and meet them at the Arrivals terminal. For the buyer’s, money is usually their least concern as their focus is on getting their new puppy safely to them. Buyers often pay up to $1,300 for a single air nanny trip. With new pet transportation jobs posted daily, YOU get to pick the jobs you’re interested in, and the days/hours you work. So even if you hold a ‘regular’ job, you can easily pick up supplemental work. So, how can you get involved and get connected with people willing to pay you to transport pets? Easy – CitizenShipper was created for just that! CitizenShipper is a ‘marketplace’ connecting people who want to ship things, with people who can do the transporting. 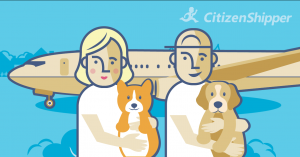 While many things are shipped using CitizenShipper, cats and dogs are extremely popular and we have a huge need to recruit additional pet shippers. While many CitizenShipper drivers transport pets via car, a rising number of flight crew personnel and regular fliers are making additional income by bidding on long distance pet shipments. Air nannies, as they like to refer to themselves, are significantly more likely to win pet shipments. Why? Firstly, shipping via plane is a lot faster and less stressful for animals than driving long distance and secondly it enables far longer routes than land shipments. Signing up is free, and simple, and you could be getting connected with customers within minutes. Sign up as an Air Nanny right away and get your first shipment! As pets flying on planes MUST be small enough to fit between your legs and under the chair, typically you’ll only be interested in cats, or dogs that are smaller than 20lbs. Price your trip based on distance. Short hops might make you $350, but longer hauls could see you net up to $1,300 per trip. Some people need to ship more than one pet at a time. Got a friend or a family member? Ask them to tag along and help! We’d LOVE to recruit you as an Air Nanny. Interested? This entry was posted in Uncategorized and tagged animal shipping, flying pets, Pets. Bookmark the permalink. This sounds perfect for me as i love animals and to fly! Great! We’d love to have you sign up. You can sign up today directly from our homepage. We’re happy to give you a call if you like and walk you though how to get started. Will we be able to chose from rescue pets going to new homes be breeders only? Hi Judy. You set the price. Very interested and experienced with flying cats. I recently signed up with Citizenshipper. Is this a separate profile?